We have several pieces of pottery in our collection made by Maria Martinez. Maria was from the San Ildefonso Pueblo, a community located 20 miles northwest of Santa Fe, New Mexico. An accomplished potter, she became internationally known for her black ware pottery. She developled the black ware through trial and error, inspired by the black ware shards discovered in nearby archeological digs. The black pottery is actually made with red clay. 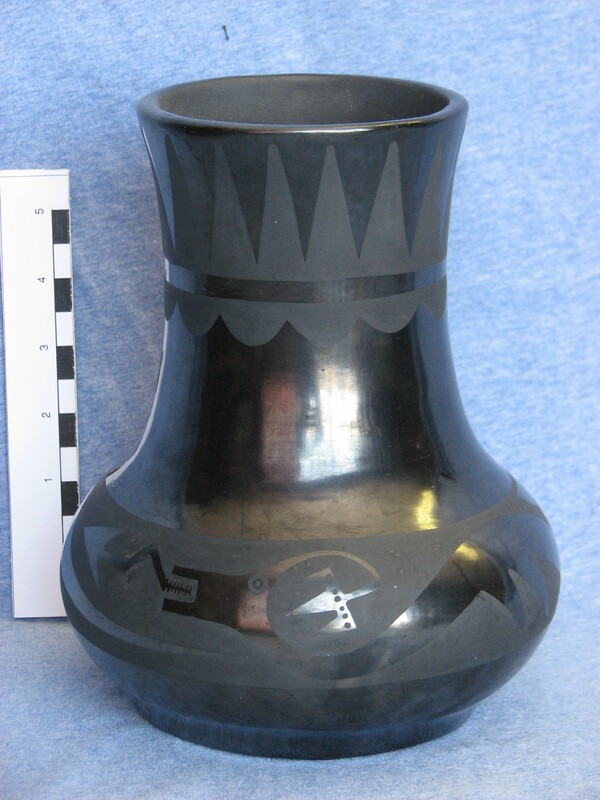 The black color comes from the firing process. Horse manure is added at the right time and the fire is smothered to create smoke. All three of the pieces appear to be glazed, but they are actually shiny from being polished with a smooth stone! The pot is made from coiled ropes of clay, (think “playdough snakes”) then smoothed with a stone. The smoothing and polishing continues until the clay shines. The design is painted on with watered down clay or “slip” before the vessel goes into the kiln for firing. Although pottery was considered women’s work, Maria’s husband Julian was an exceptional artist and painted most of the designs on her work. Cleora wrote this about the short pot pictured above: “This pot shaped bowl is 7 inches in diameter by 4 3/4 inches in height. It is made in jet black obtained by adding animal manure when the pottery is fired. Around the rim is a 2 inch band decorated in unpolished gray-black with the typical serpent design. 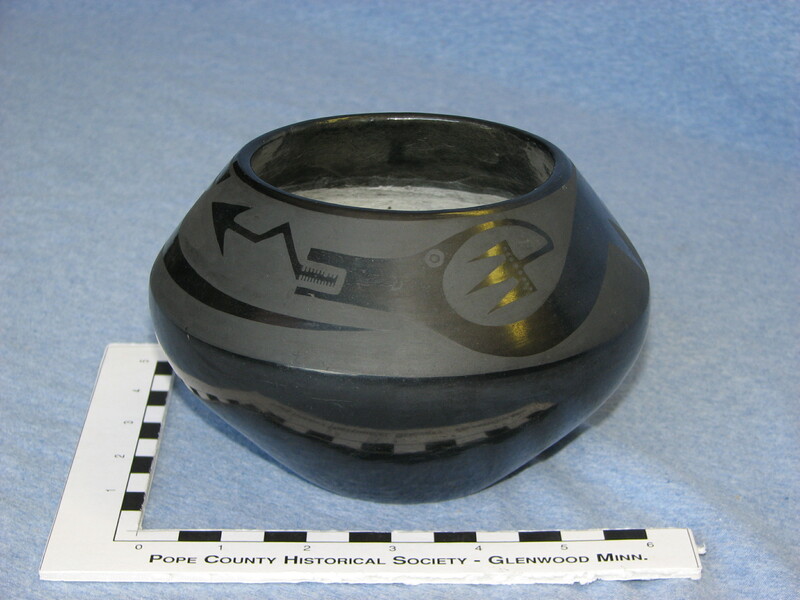 This bowl was made by Marie, (Maria Martinez) the most famous of the San Ildefonso Pueblo potters.” It is signed “Marie” which means it is probably an early (ca. 1920’s) piece. She signed her later work Maria & Julian. This entry was posted in Collection Notes and tagged A-Z, blackware, Cleora Helbing, Julian Martinez, Maria Martinez, Native American art, Southwest Pottery. Bookmark the permalink.